Imagine an MRI or CT technique that can peer inside structural materials (e.g., steels) and visualize the strain experienced by structures as they support loads. This project develops Transmission Bragg Edge Strain Tensor Tomography (TBESTT), a neutron-imaging based technique to measure 3D strain tensor fields in structural components. Applications of TBESTT include 3D fracture mechanics, crack-tip strain field mapping, residual stress mapping in additively manufactured components, strain mapping in complex environments (e.g. in H2 gas), and crystallographic phase mapping. The techniques available for making predictions of structural component lifetimes are currently limited to 2D. For example, in linear elastic fracture mechanics, the crack tip stress state, used to relate crack growth rates to lifetime, has only been calculated for simple geometries (e.g. compact tension specimen in plane-strain (2D) conditions). Extending the 2D fracture theory to 3D via finite element analysis is still limited because key input parameters (e.g. fracture toughness, Young’s modulus) are measured under 2D conditions. The uncertainty from these approximations leads to lifetime predictions which can vary by an order of magnitude. The necessary measurement to inform lifetime predictions is the 3D stress state at a crack tip. Current techniques to measure the stress state are limited by low penetration depth, limiting the application to small specimens (10-100 μm) which cannot reproduce the stress conditions found in large structures. 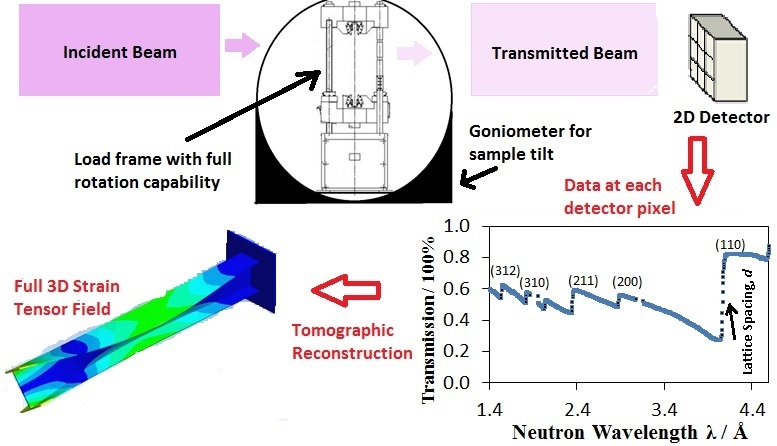 TBESTT will use neutrons which deeply penetrate most metals allowing for larger specimens – even full parts – to be studied, and will probe the strain over the entire volume of a specimen at once using Transmission Bragg Edge Spectroscopy (TBES). TBES is a recently developed technique that measures an object’s strain field by observing sharp increases in the transmission of neutrons (so-called “Bragg Edge”) through the specimen as the neutron wavelength is changed (see Figure 1, lower right). However, straight-forward application of TBES measures the strain only in a single direction, the direction of the incident beam. The critical and challenging aspect of the project is to advance experimental methods and associated algorithms to provide a tomographic reconstruction of full 3D tensor strain fields (see Figure 2).